“Statistics show that for every migrant farm position that we have out there on the farm, there are four additional full-time domestic jobs that are created to that business’ function,” said Mark Nicholson, co-owner of Red Jacket Orchards. Red Jacket Orchards, a 600-acre third generation family-owned farm has increased its participation in the H-2A visa worker program for this past harvest season. 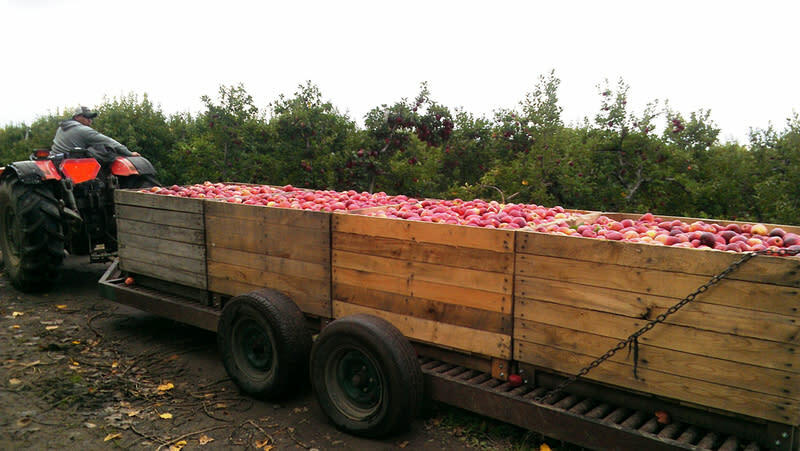 Harvest is a busy time of year for orchards like Red Jacket. Previously, Red Jacket began its affiliation with the federal worker program on behalf of the Department of Labor who works in collaboration with the Department of State and Homeland Security during their apple harvest season in 2017. Starting in the March 2018, 15 workers arrived to start pruning trees and an additional crew arrived for the actual harvest season, expanding the overall number of H-2A employees at Red Jacket to total 35 foreign workers, all of which hail from Mexico; a notable increase from the 2017 harvest season in order to accommodate the company’s growing needs for skilled labor and to fulfill a much-needed void for physically demanding work on the farm. “The ability to attract and retain migrant labor without the program had been increasingly difficult year after year. That labor just wasn’t available,” Nicholson continued. While there are federal requirements for H-2A sponsor companies to provide transportation for their workers from their country of origin to the worksite as well as other transportation needs and mandatory housing for laborers, Nicholson is passionate in cultivating connections with the greater Geneva community for enhanced social and communal networks. “Fortunately, there is a pretty robust Mexican community. Actually, some of the folks who we are recruiting to the program have family networks already in Geneva and is helpful for them and the group that comes up with them,” Nicholson added. Nicholson emphasized the importance of food education for consumers about the growth and production of fruits, vegetables and other labor-intensive products, hoping to gain a new perspective about the positive role that migrants play in the economy. “The average consumer may not realize how many times that product has been touched by migrant workers,” Nicholson said. 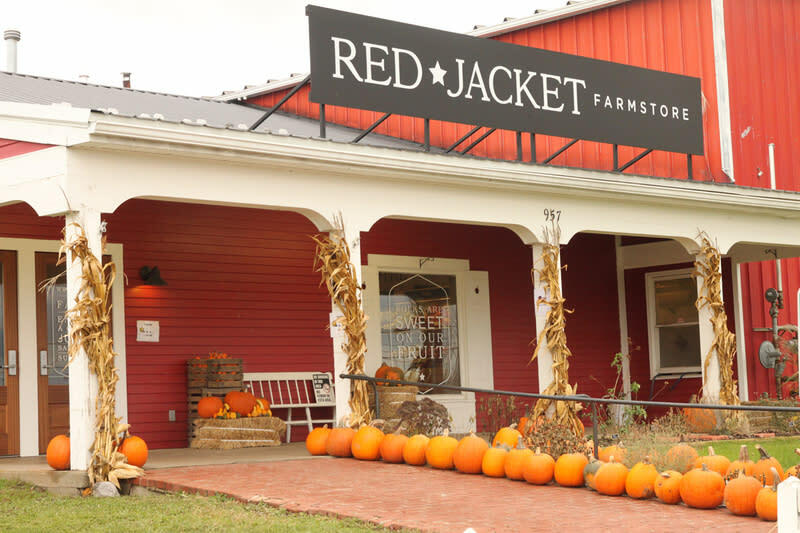 As a company, Nicholson believes that Red Jacket Orchards has an important role in expressing this knowledge and role by which agricultural migrants partake in, especially when it comes to how food arrives to store shelves. Without this foundational understanding, Nicholson fears that the nation’s food security of homegrown products is at a potential risk when policies and programs for locally food and labor force initiatives are not present in communities. Instead, imported goods may seem as the only probable alternative to domestically-grown resources, an exorbitant endeavor altogether. Red Jacket store in Geneva, New York. But most of all, Nicholson values his employees who help grow businesses surrounding the agricultural industry through operations and sales; local tractor, chemical and packaging companies, among other commercial enterprises. “We create a lot of jobs and we can only do that because of that key workforce that really isn’t available anymore domestically,” Nicholson continued. After attending Cornell University’s College of Agriculture and Life Sciences and graduating with a bachelor’s of science in pomology in 1994, Nicholson went to work in Washington D.C., focusing on agriculture policy. Nicholson served as the industry information manager for the U.S. Apple Association as well as a marketing specialist with the U.S. Department of Agriculture’s Agricultural Marketing Service. Throughout a 20-year career, he has devoted his life to agricultural issues and the continuing challenge for supplying labor. Currently, Nicholson serves as the chairman of U.S. Apple Association’s board of directors. But even after visiting the offices of public servants to share their stories from an expert’s insights, positions in favor positive policy change have not progressed, but further entrenched a hotly-contested debate between agriculture and immigration. Gabriel Pietrorazio is an undergraduate student at Hobart and William Smith Colleges who has written for the Town Times of Watertown, Connecticut and Finger Lakes Times in Geneva, New York. He’s currently an intern reporter for FL1 News, and can be reached at gabriel@fingerlakes1.com.